Llewyn Davis (Oscar Isaac) is the surviving half of a folk duo. His partner committed suicide and he is now trying to make a career as a solo act. He struggles between gigs, bouncing from one friend's couch to another, refusing to try anything else because he says that music is his career. The problem being but he rarely shows the passion for it that he claims to have. He's a defeatist who lets his frustration build up and lash out at those who do support him. That probably doesn't really sound like an interesting film, but when you think about synopses for other Coen films you could say the same thing. What makes their films truly entertaining are the scripts, characterizations and dialogue and Inside Llewyn Davis is no different. Isaac fills the shoes of a struggling, brooding artist well and Carey Mulligan (Jean), Justin Timberlake (Jim), John Goodman (Roland Turner), Garrett Hedlund (Johnny Five), Adam Driver (Al Cody), and Stark Sands (Troy Nelson) add intriguing, strange, and sometimes downright quirky roles to a film that can run the gamut emotionally. And I can't forget Ulysses the cat, who becomes another way for the Coens to show just how down on his luck Llewyn is. How could he have what it takes to become a successful folk musician if he can't even take care of or keep tabs on a cat? 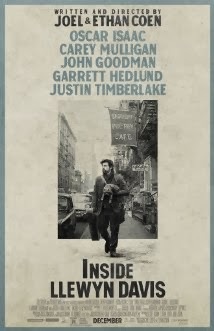 Inside Llewyn Davis isn't my favorite Coen brothers film, but I did enjoy it. If you like their work, it is worthy of paying for in a theater. The performances are good, it's shot well, and the music isn't too shabby even if I can't claim to be much of a folk fan. - The Gaslight Cafe shown in the movie was an actual cafe in the '60's that had such artists as Bob Dylan, Jimi Hendrix, and Bruce Springsteen perform there over the years. It was also the inspiration behind the name of the band called The Gaslight Anthem (I didn't know all of this, I read it in the February 2014 edition of Empire Magazine). - I was very amused by the film implying that the other folk artist playing at The Gaslight the night the film ends was Bob Dylan.